(Nanowerk News) Crystals are not as stationary as you might think. A crystal of an organometallic compound containing palladium, for example, downright jumps from a hotplate once it reaches certain temperature. An international team of scientists, including researchers from the Max Planck Institute for Solid State Research in Stuttgart, has now discovered the force that makes the material jump. According to their findings ("Colossal positive and negative thermal expansion and thermosalient effect in a pentamorphic organometallic martensite"), the material’s structure changes when the temperature ranges between 70 and 80 degrees Celsius. First there is a rise in mechanical tension, which is then discharged so rapidly that the material leaps into the air. This thermosalient effect could potentially be applied in artificial muscles and actuators. However, the tension that arises during the structural transformation can also pulverise crystals. This phenomenon, which could make chemical reactions highly efficient, was elucidated in detail by the Stuttgart-based researchers in a separate study ("Following a Photoinduced Reconstructive Phase Transformation and its Influence on the Crystal Integrity: Powder Diffraction and Theoretical Study"). 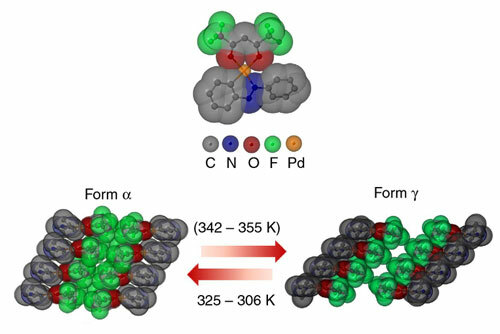 Crystalline jumping power: In the PHA molecule, organic molecule parts (one of each) containing fluorine -(F)-, oxygen -(O)- and nitrogen -(N)- are grouped around a central palladium -(Pd)- atom (top). The molecule crystallises into different forms. When it switches from the α form to the γ form at 342 to 355 Kelvin (K) – which is equivalent to 69 to 82 degrees Celsius – the crystal expands very rapidly and grows substantially, causing it to jump up from the underlying surface. When searching for sources that can power artificial muscles, material scientists are very often inspired by the biological world. That is because plants in particular contain numerous inanimate materials that react to an external stimulus such as high humidity levels with movement: pine cones and the seed capsules of ice plants (also known as fig-marigolds) open up in such a way that their seeds are dispersed, and the grains of wild wheat apply the same principle to bore themselves into the soil. Yet some crystals could also serve as engines for micro-machines and robots that require neither a power source nor a fuel supply. The organometallic compound (phenylazophenyl) palladium hexafluoroacetylacetonate, or PHA for short, forms such crystals. These crystals jump when heated to more than 70 degrees Celsius, and could therefore help flex artificial muscles. A team composed of researchers from New York University, Abu Dhabi, the Max Planck Institute for Solid State Research and the National Institute for Materials Science in Tsukuba, Japan, was now able to shed light on what triggers the thermosalient effect in PHA. “Gaining a deeper understanding of how it works could potentially help us develop materials that are suitable for practical applications in artificial muscles or actuators,” says Robert E. Dinnebier, who heads the Scientific Service Group “X-Ray Diffraction” at the Max Planck Institute for Solid State Research and, together with Pance Naumov from New York University, initiated the PHA study. The thermosalient effect occurs between two structures known as α and γ modifications. When PHA transforms from one structure into another between approx. 70 and 80 degrees Celsius, the crystals drastically expand in one direction. And this is where PHA is likely to set another record: there are hardly any other molecular combinations that switch between two structures so dissimilar in length, at least in one direction. During the metamorphosis, the crystals also substantially stretch along the second axis, while they shrink notably along the third. However, the fact that the dimensions of a PHA crystal change so drastically when switching between the α and γ structures is, in itself, not enough to make the crystal jump from the hotplate at a particular temperature. Just like athletes, who can only jump particularly high or far by exerting explosive bursts of movement, the decisive factor here is that the crystal’s structure transforms with lightning speed. And that is precisely what happens between α and γ PHA. If the material is still in the α form at around 70 degrees Celsius, even though it would in fact feel a lot more comfortable in the γ form at that point, mechanical tension starts to build up. “After reaching a certain point, this tension then discharges 10,000 times faster than in it does in the case of structural changes in which the thermosalient effect does not occur,” says Tomce Runcevski. However, the tension that arises in a crystal during the structural transformation can also lead to effects that differ greatly from a jump, as the researchers from Stuttgart have observed in cooperation with colleagues, including Diego Sampedro from La Rioja University in Spain. In this case, they examined a substance called (Z)-4-(4-bromobenzylidene)-2-methyloxazole-5(4H)-one, which they simply refer to as Z-1. When the crystals in the compound are irradiated with UV light, Z-1 molecules form pairs. In this photochemical reaction the structure of the material changes so substantially that the crystals simply crumble into myriads of smaller crystals. “Such reactions harbour potential for chemical processes in industrial applications, for example, because unlike most of the other chemical reactions, they only take place in one direction,” explains Tomce Runcevski. What could make these reactions so suitable is the fact that the countless crystals in the product do not re-bond to form a larger crystal of the precursor; the precursor therefore reacts entirely like the desired substance. In the case of most other reactions, chemists have to accept losses or perform complicated tricks that often require large amounts of energy in order to ensure that a process does not stop halfway through. The researchers from Stuttgart were also able to elucidate the structures of the precursor and the product with regard to the photochemical reaction in a crystal. That was no problem for the precursor, since it was present in the form of a single, solid crystal, also known as a monocrystal. Yet in order to be able to examine the intrinsic order of the microcrystals in the powdery product, the researchers had to devise a trick. Just like they had done when studying the structures of PHA, they applied a technique that they themselves had refined for such purposes: x-ray powder diffraction. While the methods used to analyse monocrystals produce three-dimensional data, powder diffraction only provides one-dimensional information, thus making it significantly harder to reconstruct the crystal’s three-dimensional structure. “However, we were able to refine the evaluation of the data gathered during the x-ray powder diffraction to such an extent that we now also receive three-dimensional information,” says Robert Dinnebier. This allows the researchers to not only study samples containing crystals that are too minute to be individually examined using x-ray diffraction – they can also trace the structural transformations step by step. In the case of crystalline Z-1, for example, they applied this method to determine how fast the individual steps take place. “This allows us to observe the decisive steps in the transformation processes,” explains Robert Dinnebier. And that is precisely what he and his colleagues have set out to do – not just with regard to jumping PHA or pair formation in crystalline Z-1, but also during a photoreaction that they recently together with other colleagues: another reaction that also causes crystals to jump. After all, only when material scientists know and understand the key steps that take place during a structural transformation will they be able to conduct a targeted search for substances that not only exhibit the desired effect, but also fulfil other conditions required for given practical applications – be it in artificial muscles, or resource-efficient chemical reactions.